I found a couple of recipes on the net, but ended up developing my own using the sweetened condensed milk, cream and milk formula I’ve used in a couple other recipes. 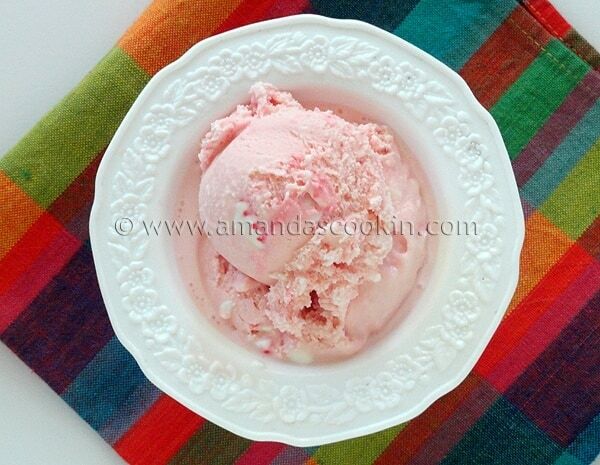 Pink peppermint ice cream isn’t much different than mint chocolate chip ice cream. There are basically 2 major differences. The mix-ins (peppermint candies as opposed to chocolate) and the amount of vanilla that’s added to the mix. The amount of vanilla makes a huge difference in the flavor. The only thing I did differently the second time around was the crush the peppermint up a little more. I had some pretty big chunks in the first batch (as pictured below), it was better with smaller pieces in my opinion. This is now a permanent recipe in my collection! You can use candy canes or those little round peppermint candies, commonly known as Starlight Mints. Put them in a plastic zipper gallon bag and squeeze out the air. Zip it shut and crush the candy with a meat mallet or hammer. Hint: If you’re looking for something else that’s fun to make from starlight mints or candy canes, try this Peppermint Oreo Popcorn Bark! Sorry, I didn’t count how many candies, but you’ll need around 15 or so candy canes or a couple handfuls of the round candies. Just crush until you have a cup’s worth. If you happen to remember, leave me a comment with how many it took to get to a cup. I’ll update this next time I make it. 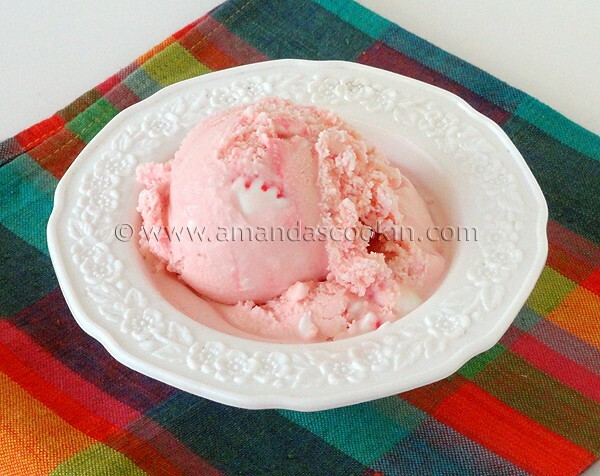 You’ll add the crushed candies a few minutes before turning off your ice cream maker. Then freeze! 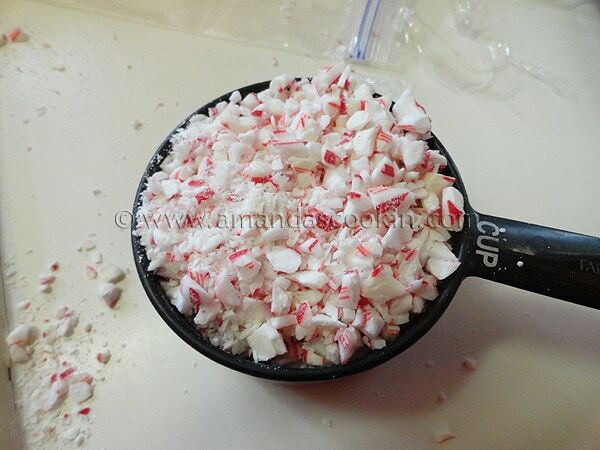 Combine all ingredients except for the crushed peppermint candies in a large bowl and whisk until well combined. Pour into your ice cream maker and process according to the manufacturer’s instructions. 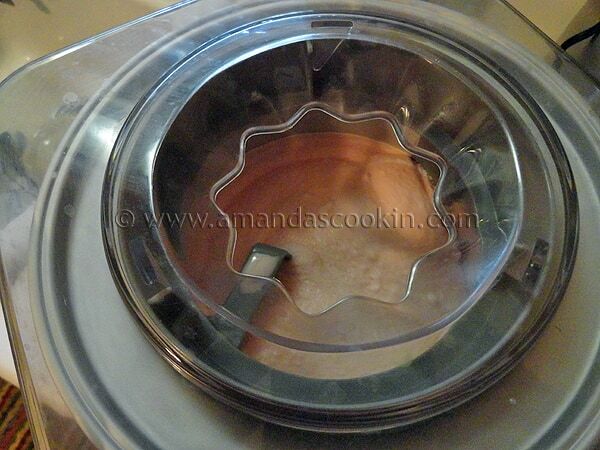 minutes before churning is complete, add the crushed candies to the ice cream maker. Turn the ice cream out into a freezer container and freeze until hard, usually a few hours or so, but overnight is best. Thanks Rhonda, how fun! Hope you enjoyed it! Merry Christmas everyone! So, I have to say, I made this recipe yesterday and ended up eating it as my pre-Christmas breakfast breakfast it was soooooooo good! It has made my list of favorites for sure! Hey, I love your recipe. I was just wondering what ice cream maker you use? I have the Cuisinart ice cream marker and is have a bowl you freeze in the center. Does it matter what machine you use with the ingredients you included? Great idea Colleen! I am actually making it right now and am using chocolate mint candy canes for the first time in it! No there’s no cooking, it’s just that i can’t change the verbiage of that field. So basically it’s just the amount of time to make it. I’m a newbie. Is heavy cream the same as heavy WHIPPING cream? This made our Thanksgiving dessert! Complemented our “Death By Chocolate” perfectly! Thank you! I will never buy store bought ice cream again! I made this as an after-dinner surprise for the family and they really liked it. Easy to make, and this is coming from someone who’s not a good cook. I didn’t add the food coloring (I avoid additives like these whenever possible) and the ice cream looked good studded with the small pieces of peppermint candy. Thanks for sharing your recipe! I’ll be making it again. Sounds wonderful, so glad you liked it! I actually need to make some, I noticed the grocery store brought theirs back for the holiday season. Just made it with the same ice-cream maker that you have! Absolutely delicious, but I added an extra 1/2 teaspoon extract, it was very vanilla-y. 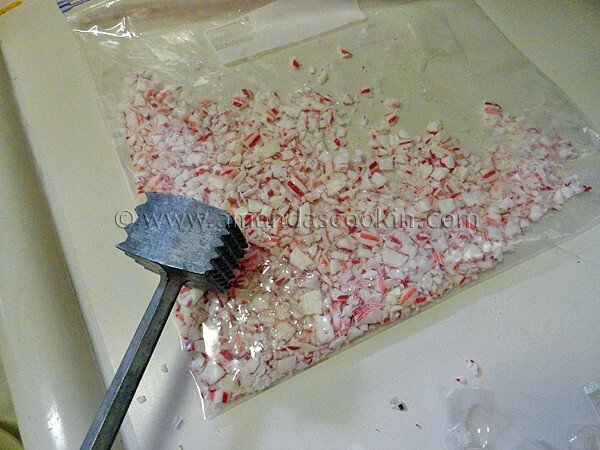 I used a cup of medium sized crushed peppermint pieces, and crushed some into a powder that I added about halfway through the churning process. Also used less food coloring for a less bright color. Awesome, so glad you liked it Shannon! I have an old style Rival ice cream freezer…where you put the rock salt and ice in and this isn’t setting? I tried putting it in the freezer for a couple hours to get it really cold but no matter what it’s just turning back to liquid each time I start to churn it. The only thing I’m doing differently this time is I’m using coarse sea salt instead of rock salt…would that matter? Hi Emily. I have never had a problem with this recipe and have made it numerous times. It sounds like the issue may be coming from your ice cream maker. You may want to call the manufacturer and see if they can help troubleshoot it with you. Sorry! You’ve probably already solved your problem but if not: you probably need more salt in your ice cream maker. Salt is used to lower the freezing point of the ice, causing it to melt so that as it melts it can draw heat from the custard, helping it to freeze more quickly. Too much salt and the ice cream can freeze too fast, becoming hard and crusty; too little salt and it won’t firm up at all. You should always start with a modest amount of salt and check the results after 10 minutes, at which point the ice cream should be beginning to firm up. If it hasn’t then add more salt; if it’s hard you’ve added too much to start with and are pretty much out of luck. If you make a lot of ice cream then you should invest in an ice cream maker like the Cuisinart ICE-21. It’s a bit of a pain to wait until the bucket is fully frozen before churning but it takes the guesswork out of the salt/ice mixture (and the physical labor out of the churning thought that isn’t necessarily a good thing!). I made this and loved it!! I was just curious if you could switch out the peppermint extract for other extracts to make other flavors? Would it work as a straight vanilla ice cream? I keep trying to find a vanilla ice cream recipe that doesn’t use eggs!! How many quarts does this recipe make? We have a 4 quart and 6 quart machine and I’m not sure which one to use :) Sounds delicious!!! I just made this and it turned out delicious! It was sooo fast and easy too! I did add a little more peppermint extract because I like mine a little more pepperminty :) Thanks for the recipe! Just wondering…my Cuisinart ice cream maker is only 1 1/2 qts. so I assume this would be too much mixture for my machine? 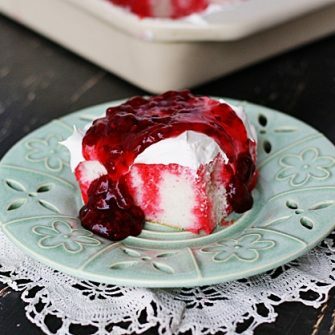 I love peppermint and this looks absolutely the best! 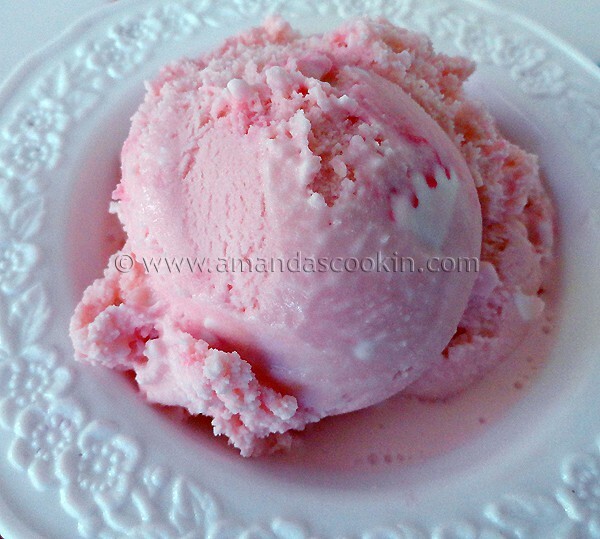 I have never used or even thought of using sweetened condensed milk in homemade icecream. I made this last night and let me tell you I will be using sweetened condensed milk whenever I can making ice cream! This is amazing. Definitely will be making it often in our household! I think I’ll home made some Magic Shell for people to drizzle on this if they want. I’ve been wanting to try that homemade kind anyway. I have one kid who does NOT like chocolate, so I think I’ll leave it out. (I know–CRAZY kid.) ;) Yes, from the time I hit send on the last comment, I decided what to do within seconds. Ok, so I didn’t make the mint chocolate chip one the other day like I said I was going to, and started to make it today, but I don’t have mint extract, just peppermint. I this is churning right now, but I also don’t have the little mint candies, so I’m trying to decide if I should leave it as is or drizzle in some melted chocolate, because I think chocolate goes with peppermint as well, but hmmm. I’ll decide by the time it’s done churning. Only difference I made was I’m using fat free cond. milk and 2% milk. Smells good! You probably mention it in a past post, but what ice cream maker do you use? I’ve never bought one because I’m not really familiar with the different brands. Hi marla :) I have a Cuisinart, it was in the neighborhood of $75-80. I LOVE it. Amanda, this looks like amazing! I have never used sweetened condensed milk in an ice cream recipe and this is very tempting! I even have leftover candy canes too! I am totally sold on using sweetened condensed milk in ice cream now. Creamy, delicious, and fast! No cooking! 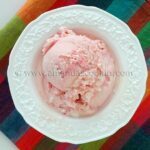 Very originally to make a pink peppermint ice cream. I must ask, would you use last year’s candies if there were still leftovers? Looks delicious! What a great treat to have before the holidays….I love the colors! This looks and sounds amazingly delicious! I’m a sucker for anything pink! I love that!! It reminds me of Christmas, even tho I don’t normaly eat ice cream in the winter, I could see myself making and eatting this! !